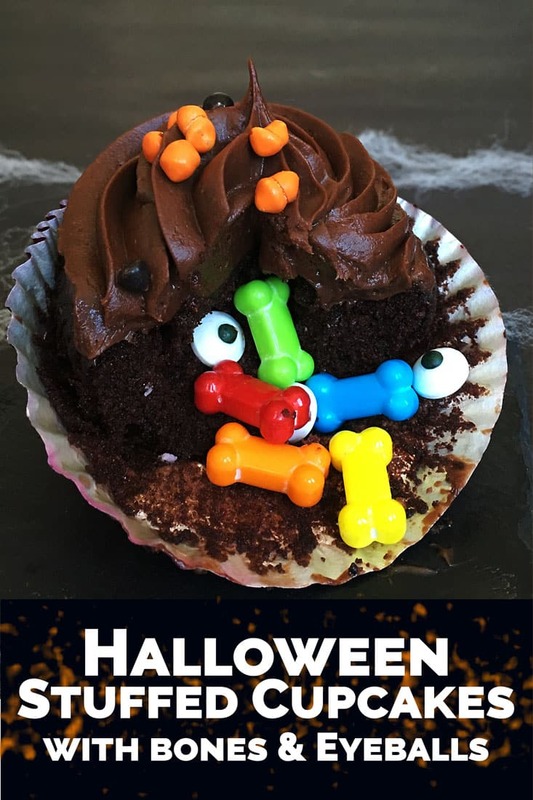 What’s more fun than these stuffed halloween cupcakes with a hidden spooky surprise? This recipe is sure to please kids and adults alike. Now that Labor Day and summer are officially behind us, it’s time to start thinking forward to Halloween! Are you planning a Halloween party this year? I feel like every year I end up working at the children’s hospital and I wouldn’t have it any other way! Halloween at the hospital is a joyous day, filled with costumes, trick-or-treating, and decorations. 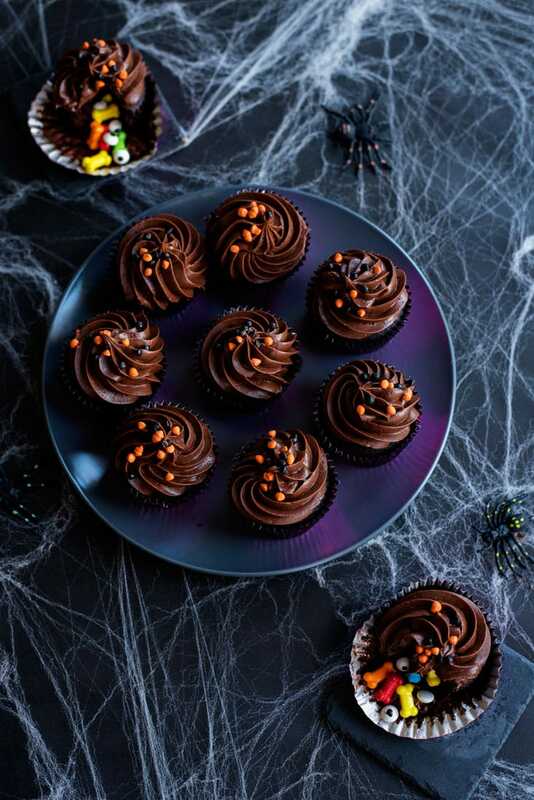 If you are planning a Halloween party, you absolutely have to make these stuffed cupcakes! If you’ve been reading long, you’ll know that I can never resist stuffing a cupcake with something fun. So far I’ve done lemon curd, colored cake balls, mango curd and chocolate ganache (for s’mores). There’s just something so fun about biting into a stuffed cupcake. The cupcakes themselves are also amazing. They are super moist and chocolate-y, and sweet but not too sweet. They are one of my favorite recipes that I make over and over. They are topped with an also-perfect chocolate cream cheese frosting. Just because the cupcakes are fun to eat doesn’t mean I was going to skimp on the delish factor! I made these cupcakes as a part of my ongoing Youtube Cooking Series with my friend Ally, from Fashion by Ally. Make sure you watch our latest video, where I explain how to make this fun Halloween treat, right here. Then check out Ally’s video! In the bowl of a stand mixer, mix cream cheese and butter until smooth and creamy. Add vanilla. Mix in powdered sugar and cocoa powder on low, increasing speed until completely combined. Use a paring knife to core each cupcake leaving a layer of cupcake at the bottom (see video). Set the top of the core aside and do not discard. Fill each cupcake with candy. Replace core and frost. For these cupcakes, I used a large closed star tip. Start at the outside and pipe a swirl, ending by releasing pressure and lifting straight up from the center. Top with sprinkles. Don’t wait more than a few hours before serving, or the candies will soften and taste funny. These are darling and love that these cupcakes are topped with chocolate cream cheese. Yum! The bones look so large in this photo but I’m sure they’re probably not to fit in the cupcake. Fun recipe that I’ll be saving to try. I could imagine biting down into one of these, and breaking my teeth.